The taxidermy of Darlene D’amour was found in a tiny museum, or cabinet of wonders if you will. She was placed in a vitrine including, amongst other oddities, a model steam boat in Amsterdam(1). After years of researching her story came to life. Darlene D’amour was a member of the European musical act Bubblé Jeunesse D’oree (bubbles golden youth), managed by O.Bartik(2) This was really an astonishing act: Three women playing the trumpet under water wearing mini dresses. They were set in a huge aquarium filled with brass flowers and golden glitter. This act was an expensive one, and thus didn’t become as populair as it should have been. At some point Darlene, allegedly, unfortunately cut her ankle at one of the brass leaves and lost her foot(3) and she bled to death in the water tank. Mounted Lady Trumpeteer: The Story is written by Mimi Berlin. 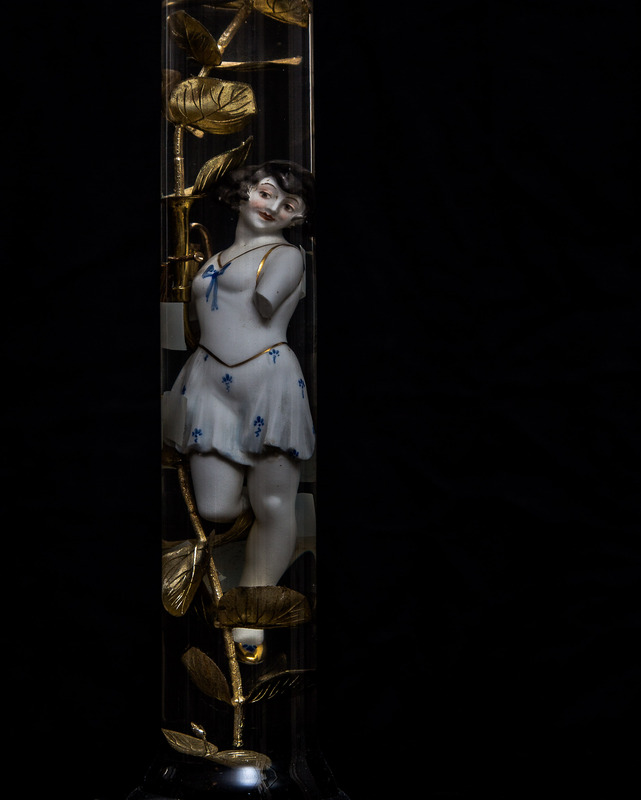 Very loosely based on an advertisement in Billboard magazine 1906, on musician Darlene Wright, and on the private collection of Freundin T.
(1) This statuette is part of the private collection of Freundin T. since 2013. (3) The Foot of Darlene Love, History of circus Legends by Mimi Berlin, 2013. (4) The No Harm Harem, a series of statuettes by Mimi Berlin. Mimi Berlin, 2013. Mounted Lady Trumpeteer, Mixed Media ( 1920s ceramic, plastic, copper, glass, cello-tape, rubber, water) ø7.5/4.5 x 27 cm. The Mounted Lady Trumpeteer is part of the History of Circus Legends, a series of unique figurines handmade by Mimi Berlin.